Don’t forget to Reorder for 2019 NOW! We speak to retailers about training regularly; what makes good training and not-so-good training. Ultimately, training involves important teaching elements — ensuring that trainees retain knowledge but also “learn by doing.” Some folks subscribe to the idea that learning by doing is best. I like to tell them they are half right. 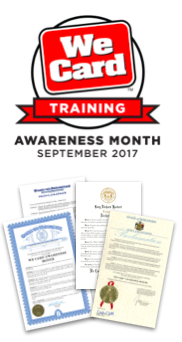 On the job learning is vital, but first, front-line employees must practice skills that will lead to preventing illegal underage sales. Think about how learning by doing might work with a new teenage driver. Without thorough practice and instruction, accidents can happen. Now, think about employee training: without practice and role-playing before a live underage sales scenario, illegal sales may happen. Signing a form that says an employee understands store policy and laws, showing a short PowerPoint presentation and telling them not to sell is only a small step. A real, interactive SCORM & FDA compliant training program like We Card is a big step in the right direction. And We Card’s training is leading the eLearning revolution. Our new e-learning course provides not only education and extensive practice, but a whole host of customer scenarios of underage purchase attempts with e-cigarettes and vaping products, along with traditional and newer forms of tobacco products. And we know minors are very creative and innovative when it comes to buying e-cigarettes or tobacco. 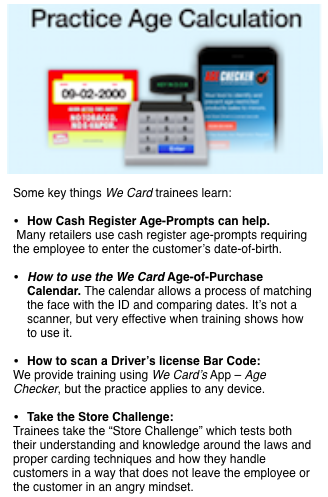 We Card training covers all this and more. We use innovative eLearning techniques to teach how to handle customer IDs, how to spot Fake IDs and we go through a series of interactive exercises that give employees practice, practice, practice before going live. We cover FDA requirements and every curriculum element FDA’s Tobacco Retailer Training Programs document outlines. In short, we’ve been at training a very long time – something like 23 years – and we know what works and what doesn’t because we’ve listened to every possible guidance source, and especially listened to YOU the retailer. We’re confident that if you try the course, you will see results. The We Card Program, Inc.
© 2018 Copyright - The We Card Program, Inc. All Rights Reserved. &COPY;2019 The We Card Program, Inc. All rights reserved.